Only eight questions in this week’s delayed mailbag — sorry, but the Aaron Judge injury thoughts were more pressing — because a whole bunch of questions sent in this week were rendered moot by the Zach Britton trade and J.A. Happ trade. Send your mailbag questions to RABmailbag (at) gmail (dot) com and I’ll answer as many as I can each week. Greg ask: Is Archer a candidate for the Yankees anti fastball approach? 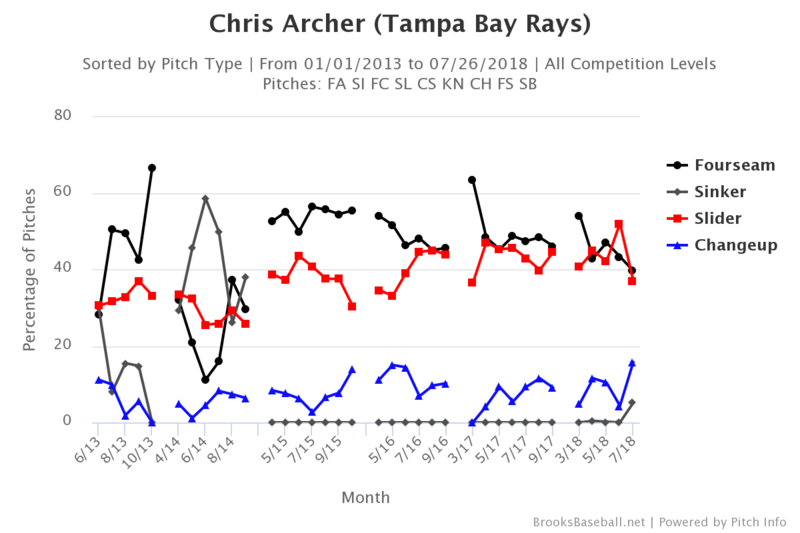 The Yankees added Happ yesterday but I don’t think that will take them out of the market for a controllable high-end starter, like Chris Archer. 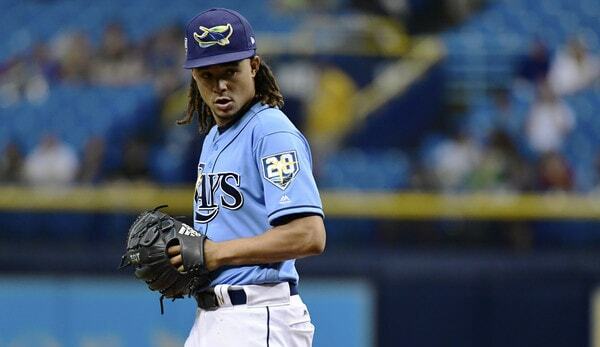 Or at least like Chris Archer was once upon a time. The Yankees have been scouting him, so, if nothing else, they’re doing their due diligence. I imagine there is some level of interest. Archer’s been throwing his slider as often as his fastball for almost three full seasons now. Maybe he’s a candidate for the anti-anti-fastball approach? Get him to start throwing more fastballs and fewer sliders, and maybe he’ll get back to where he was from 2013-15? Jerry Crasnick spoke to a scout recently who called Archer “stubborn when it comes to pitch selection,” which I thought was interesting. He’d already doing the anti-fastball thing. Perhaps he needs to go back the other way. Jeremy asks: Mike King is looking great this year in AA. Also had a solid season in A ball last year. Is he turning into a real prospect at this point? King was always a prospect. Not a very profile one, but he was a prospect when the Yankees got him from the Marlins in the Caleb Smith/Garrett Cooper roster shuffle over the winter. The 23-year-old King went into last night’s start (seven scoreless innings) with a 2.08 ERA (2.63 FIP) with 24.4% strikeouts, 4.9% walks, and 49.1% grounders in 108.1 innings split between High-A Tampa and Double-A Trenton. King’s best attributes are his two-seam fastball and his command. He has quality life on his 91-95 mph heater, showing the ability to run and sink it on or off either corner. He generates a lot of groundouts and misses his share of bats … King lacks a solid second pitch. Both his slider and changeup are decent offerings but unlikely to bother big league hitters. Unless he can improve them, he might face future as a middle reliever who depends on his sinker. The Yankees have to help King figure out an out pitch. Maybe it can be the slider, maybe it can be the changeup. Whatever it is, the ability to develop that putaway pitch will determine whether he can succeed at the next level, or settle in as an up-and-down depth guy. King’s had a great season though, and he’s definitely worth monitoring. Jeremiah asks: If Sanchez is going to be shut down for an extended period, does it make sense to add some depth via trade or just go with Romine/Higgy combo? For sure. I thought they’d bring in another catcher the first time Gary Sanchez went on the disabled list. At least a journeyman type to stash in Triple-A, you know? Didn’t happen. Brian Cashman said Sanchez could be out until September, so this is going to be an extended absence. So yes, bring in another catcher. The trade deadline is coming up and I’d be cool with the Yankees splurging for an actual big leaguer and pushing Kyle Higashioka back to Triple-A. Wilson Ramos and Devin Mesoraco are the notable impending free agents, though I’m not sure whether they’re realistic trade targets. But yes, get another catcher please. John asks: Is it just me or is Tanaka the best fielding pitcher the Yankees have had since Mussina?
? When it comes to fielding a batted ball, Tanaka has been perfect thus far with the Yankees. Not one single error. You know what means, right? Blame me when Tanaka makes three errors in one inning in his next start. Jamie asks: Given the new state of the bullpen after the Britton acquisition, do you think that there’s any chance that the Yanks would try to bullpen the Wild Card game if it came down to it and save Severino to potentially pitch twice in the division series? The Yankees essentially did this last year, right? Luis Severino got one out in the AL Wild Card Game against the Twins and the bullpen had to take it the rest of the way. And remember, the bullpen was a mess in the ALDS after that. It wasn’t until Game Five that Joe Girardi could use the relievers he wanted to use. In the first four games the Yankees kinda had to get by with whoever was available on a given night. That’s how Tommy Kahnle wound up with a two-inning save in Game Four. Anyway, could the Yankees go with a bullpen game in the AL Wild Card Game? Yeah, I suppose so. It’s always possible. I still think the best plan is starting Severino with the bullpen ready to go behind him, like last season. It’s one game with your season on the line. Go with your best. Severino, at least up until his recent rough patch, had dominant reliever numbers as a starting pitcher. Do all you can to win the AL Wild Card Game and worry about the ALDS when you get there. Or, you know, just win the AL East instead. Daniel asks: Mike, what’s up with Stanton’s batted ball profile? For a guy who hits the ball as hard as he does you would think he’d be aiming to hit the ball in the air more, but he’s near the top of the league in GB%. On one hand, Stanton has been crushing the ball since early May and he’s on pace for 37 home runs. On the other hand, that 47.9% ground ball rate is 35th highest among the 160 hitters with enough plate appearances to qualify for the batting title, and that’s way too high for a dude with his power. Needless to say, the more Giancarlo hits the ball in the air, the better. 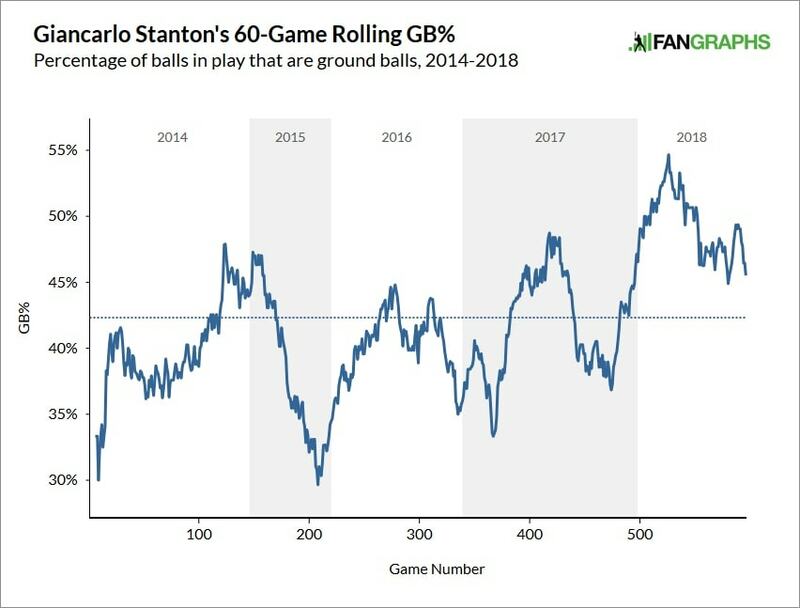 His grounder rate is trending down in the graph, so perhaps that means he’s coming out of it now. Paul asks: Did we ever find out why Clint Frazier was transferred to the Major league DL? Is that some kind of bookkeeping thing to help them in some way? Frazier first felt the post-concussion migraines while he was still in the big leagues, specifically on this play. He was in the big leagues, he felt the migraines and received treatment, the Yankees later sent him down, and the migraines got worse when he attempted a diving catch in Triple-A. Because the migraines started initially in the big leagues, Frazier was transferred to the MLB disabled list, where he collects big league pay and service. Works the same way with a tight hamstring or anything else. Frazier technically got hurt with the Yankees so he goes on the big league disabled list rather than Triple-A disabled list. Daniel asks: If the Happ trade.hadn’t happened, McKinney would be the fourth outfielder and Drury would be at least platooning at 3rd (with Andujar at DH) after the Judge injury. Would the Yanks still have made the trade? Yeah, I think so. I think they would’ve kept Billy McKinney given the outfield situation, and found another way to complete the deal. I have no idea how the Blue Jays feel about him, but I can’t imagine McKinney would’ve been a deal breaker. Platoon corner outfield types hitting .230/.294/.502 (120 wRC+) in their second year at Triple-A are that in-demand. I feel like taking McKinney out of the trade is a gap the Blue Jays and Yankees could’ve bridged somehow. I don’t think the Judge injury wouldn’t stopped the Yankees from trading Drury though. They need another pitcher more than they need another third baseman.